Fast and reliable, the Redco� Lettuce King� IV delivers the speed, consistency and chopping performance you need at a fraction of the cost of an electrically powered machine. You can prepare iceberg or Boston lettuce days in advance and not worry about it turning brown because the Lettuce King� IV doesn't "bruise" the lettuce during chopping. The separately sold Redco� Lettuce King� IV Drum Ring saves prep time and streamlines handling for high-volume chopping of lettuces. Fits snugly over Rubbermaid� Greenskeeper� storage drums. 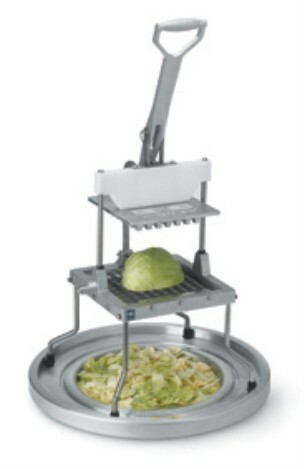 Use with the Vollrath Redco� Lettuce King� IV for consistent performance and chopping efficiency. For parts information, please refer to the user manual for this product.